Weed growth is one of the most common problems that affect outdoor concrete surfaces. This type of grass is very persistent and will grow back no matter how regularly we pull them out. The worst part is, they could grow even in the smallest of cracks on a concrete surface. It may seem harmless but its growth actually tears the concrete apart from inside. Here are some helpful tips to remove weeds and to keep them from growing back. 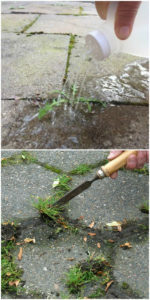 Removing Weeds from Concrete Driveways, Walkways, etc. Vinegar – Spray some vinegar on the weeds until they die. You may need to spray several times, depending on how thick the growth is. Just make sure not to spray on other plants because it could kill them, too. Weeder – A weeder is a tool that is specially designed to remove weed along with its roots. It does not completely solve the problem but it slows down weed growth. Commercial Herbicide – It is expensive but it is effective. It kills the existing weeds and keeps them from growing back. It is, however, quite dangerous to use as it emits fumes that could harm plants, pets, and even people. Prevention is better than cure. The same goes for concrete surfaces. Here are some preventive measures you could take to keep weeds from growing on your outdoor concrete. 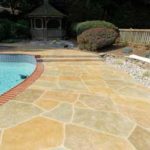 Decorative Concrete Coatings and Overlays – Coatings or overlays create paver or tile-like patterns without real gaps. Weed won’t have any place to grow from so you get to maintain the seamless surface without any problem. Seal or Fill the Cracks – Concrete repair is necessary to address those cracks and remove any spots from which weed could start to grow. Landscape Fabric or Geotextile Mesh – These are installed before the concrete is poured. It makes it more difficult for weed to get past the mesh, thus, prohibiting its growth. Salt – Mix salt with the soil to sterilize it. Nothing will grow in such soil. Just make sure that you avoid areas where you do want plants to grow. If the weed problem you are facing is getting worse and getting more difficult to handle, consult a local weed control company to help you deal with it. Just make sure to discuss your options well and to choose a less toxic method if available.